Home / Bollards & Post Covers / What Type of Bollard Do I Need? What Type of Bollard Do I Need? Bollard covers can cover concrete and steel security posts to enhance the aesthetic of a site. Bollards are short posts that dot the landscape as visual guides and vehicle obstructions. Their low profile means they often escape notice and consideration. 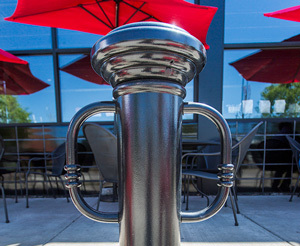 Bollards come in a wide variety of styles, and have many different uses; it can be surprising that two very different site furnishings fall into the same category. With this diversity of bollards available to planners and architects, it’s important to consider all the aspects of a development, in order to pick the best model. Vehicle access: should the bollard permanently or temporarily restrict vehicle access? Impact protection: what sort of impact, if any, should the bollard absorb? Site furnishing: how can the bollard help create a user-friendly site? Visual impact: as a visual guide, should the bollard be contrasting, complementary, or unobtrusive? Bollards are often placed to prevent vehicles from driving through an area, or to guide traffic along preferred routes. In many standard installations, the bollard placement is permanent. The bollard might be embedded in fresh concrete or affixed with bolts, anchors, or adhesives, but it will not be removed unless the site design changes or the bollard is being replaced. However, in some installations, vehicle access is intended to be variable. Bollards are useful where vehicle permissions change with the season, the use of the site, or the type of vehicle. A parking space closed to all but delivery vehicles. Removable bollards have receivers installed in concrete that secure an on-duty bollard with a lock yet allow the bollard to be unlocked and lifted free. Simple styles of bollard slide into the receiver and are padlocked to the receiver lid or to a small chain. 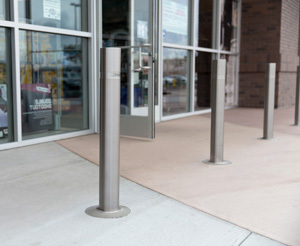 For more ornate styles with bases wider than a standard receiver, a thick steel pin is threaded through both the bollard and a specialized internal mounting before being locked. When not on duty, these bollards can be unlocked, lifted, and moved out of the way to allow access. Removable bollards come in all designs so can do double duty, like providing bicycle parking or solar lighting. 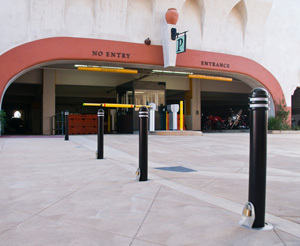 Telescoping or retractable bollards have a receptacle below grade. When stowed, they are unlocked and lowered into the ground, and therefore do not require lifting and transport. 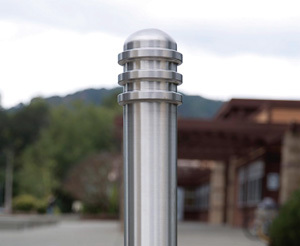 Telescoping bollards are usually sleek and minimally decorated, but they come in a range of colors. There are both manual and automated versions of telescoping bollards; the automated versions need substantial below-grade mechanical infrastructure. Collapsible or fold-down bollards are hinged bollards that lie down on the road surface to provide access to parking lanes, spots, or service access areas. The central post has a small diameter so that when they are collapsed, even low-slung vehicles can easily pass over them. Certain fold down styles come with bike-locking arms, which lie flat on the ground when folded. Bollards are becoming well known for their ability to provide impact protection against vehicles. However, it is a mistake to imagine all bollards need to do crash-protection duty. There are many levels of impact resistance, from flexible to completely rigid. Any high-impact bollard has a deep concrete footing and reinforcement throughout. This means that most removable and fold-down bollards are low-impact. Flexible bollards are designed to bend upon vehicle impact. If they are run over, they have enough flexibility to bend all the way to the ground and then bounce back up, having sustained no damage. They are helpful in many situations as a visual guide that does no damage to a car that strikes them. As lane delimiters, they are flexible enough to move should a wide-turning truck need extra room to navigate; as parking posts, a driver can bump the bollard with no damage to car or bollard. Decorative bollards are installed to enhance architecture or landscape. They act as visual guides that enhance an area, perhaps providing lighting or bike parking. In places where they are not exposed to vehicle traffic there is no need for them to be impact-protective, although many decorative bollards can be installed with a high-security core where needed. A mixture of low and high impact bollards with the same decorative aspects can bring a consistent look to a building or streetscape. 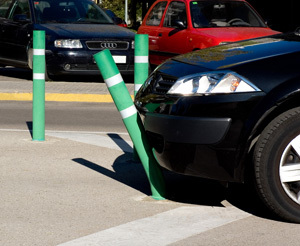 Security and safety bollards block collisions for the protection of people or property. Low-impact security bollards are bollards installed in indoor spaces where they provide a security function such as protecting inventory or equipment, but against light, slow vehicles like cleaning machines. High-impact security bollards are designed to protect people and property in the event of a vehicle crash. 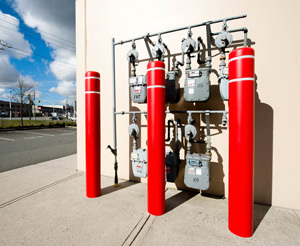 They are often installed in front of store fronts, utility meters, patios and other places where incursion is a danger. Security installations are usually steel pipe sunk into the substrate and filled and surrounded with fresh concrete. Larger pipe diameters are more effective against larger vehicles at greater speeds. High-impact security posts are often covered to fit the aesthetic of the site. Crash-rated or anti-ram bollards are installed where there is threat of active vehicle attack against a site. They are common around government buildings, large open areas, and in front of high-value small-item storefronts vulnerable to ram-raid robbery, like jewelry or electronics stores. Crash-ratings are the result of testing and guarantee the bollard will stop cars of certain sizes in a specified distance. Bollards are visual guides used in placemaking. They mark borders and boundaries, but remain a permeable part of the landscape, unlike a fence or other barrier. Often, their presence denotes a change in an area’s intended use. A row of bollards along a rural pathway encourages people to hike or bike on the trail without forbidding access to the surrounding landscape. A ring of cast iron bollards hooked with chains suggests people stay out of a garden, yet allows access to retrieve a frisbee or clean up after a pet. A border of bollards separating a building’s frontage from the sidewalk encourages two different walking-speed zones, so that the building’s users do not interrupt or get overwhelmed by the bustle of the sidewalk as they open an umbrella or park a bike. Bollards can also set out a patio, playground, or seating area. This visual guidance can be architectural and decorative, to enhance the landscape without drawing undue attention, but in other areas might be installed to be more obvious. Along bike routes, in parking lots, and in other traffic situations, high-visibility bollards might be chosen to create lanes. Visually, bollards can also work as parking posts, showing vehicles the end of the stall in a highly visible way. Unlike concrete stops, they will not scrape up the underside of low bumpers. 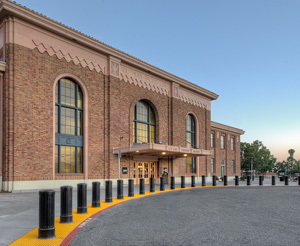 For organizations with sustainability initiatives, bollards can be hardy, low maintenance site furnishings that answer this mandate and while adding user-friendly features to a space. Bike parking bollards have features that allow cyclists to lock their bicycles securely. These come in a variety of styles, including traditional ring-and-post bike parking, as well as decorative or modern options. Bike bollards are available in permanent, removable, and collapsible mountings allowing these furnishings to do double duty controlling vehicle access and providing bicycle parking. 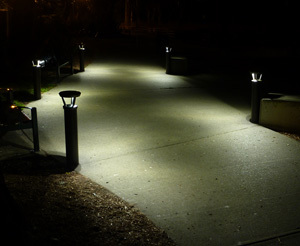 Solar bollards are tough, impact and weather resistant lighting options for outdoor spaces. They are self-sustaining and do not need an electrical grid to maintain illumination. With onboard intelligence and high-capacity batteries, these LED lights are efficient enough to stay on for up to 14 days without direct sunlight. Lighting bollards are not available in collapsible styles, but can be permanent or removable, and can come with bike-locking arms, making for a truly versatile bollard. Bollards are a visual communication tool. Aesthetic is often a deciding factor when picking the best style for an application. Modern architectural bollards are often sleek and lightweight, with a slim columnar profile and understated decoration. Black is a common color for modern styles, but this category introduces stainless steel bollards, a popular material in current design. Modern fixtures are available as bike and solar bollards, and can be installed with any level of impact protection. They can also be installed permanently or be used to give variable vehicle access in removable, retractable, or collapsible installations. Decorative bollards are used to enhance many classic architectural styles and were influenced by historical designs. Maritime bollards, originally found on wharfs for tying boats, are usually short and narrow through the midsection in order to hold ropes fast. Though marine bollards are still used for their original purpose, their distinctive profile has also been adapted to other settings. Another common style follows the tradition of burying decommissioned cannons to function as posts around buildings and throughout a streetscape. 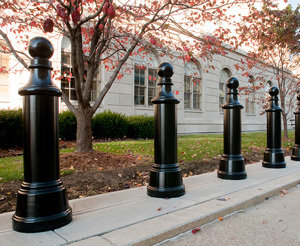 These decorative bollards often have tapered or fluted bodies, and feature distinctively shaped caps, like the cannon bollards that inspired them. 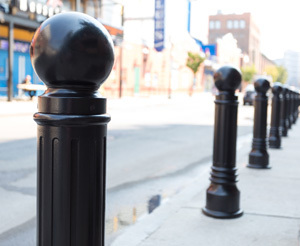 Commonly these bollards are black, to provide sharp contrast to the buildings they enhance. Classic styles can be used in low-impact, removable, or in security applications as a cover over steel pipe. Some have bike locking variations available. High-visibility bollards are often chosen in parking lots and around utility poles where standing out is more important than fitting in. 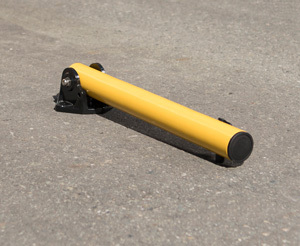 Safety yellow can be powder coated over any metal model, or be found in plastic bollard covers that slip easily over security pipe. 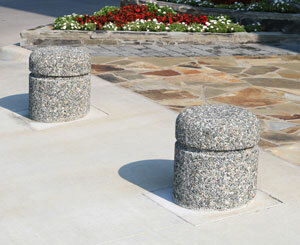 Concrete bollards offer a weighty profile, adding a rugged or textured look to a site. Textured concrete bollards featuring embedded stone can offer visual interest with an outdoorsy theme. Fine concrete formed into familiar shapes like boxes or spheres look at home in Brutalist or some Modernist architecture styles. Bollards of any of these styles might be chosen but then painted or powder coated to remain unobtrusive to a site. 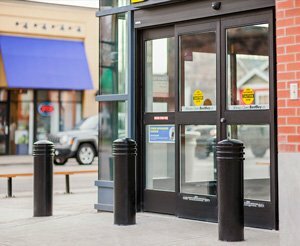 For example, strip malls or store fronts may choose bollards in the same color as the building’s exterior, so that the bollards create a barrier but do not distract the eye away from signs or displays. Large sites often require different groups of bollards to perform different functions. There might be places where high-impact security is needed as well as places where vehicles have variable access; areas where bike parking is desirable and areas it would be inappropriate. For any designer, architect, or city planner, aesthetic is an important consideration throughout. Once function at each location is determined, consistent or contrasting styles can be chosen to allow the bollards to fit well with their environment and with each other. Taking care to evaluate all the requirements for both form and function can help a site planner feel confident they’ve chosen the best bollards for their space.